(Or, "how I've found yet another way to spend more quality time with myself"
So many people have been asking me how I make my masks lately, I thought I'd outline my process. I took pictures as I built a very complicated mask, so that I could explain, step by step, exactly how I do what I do. 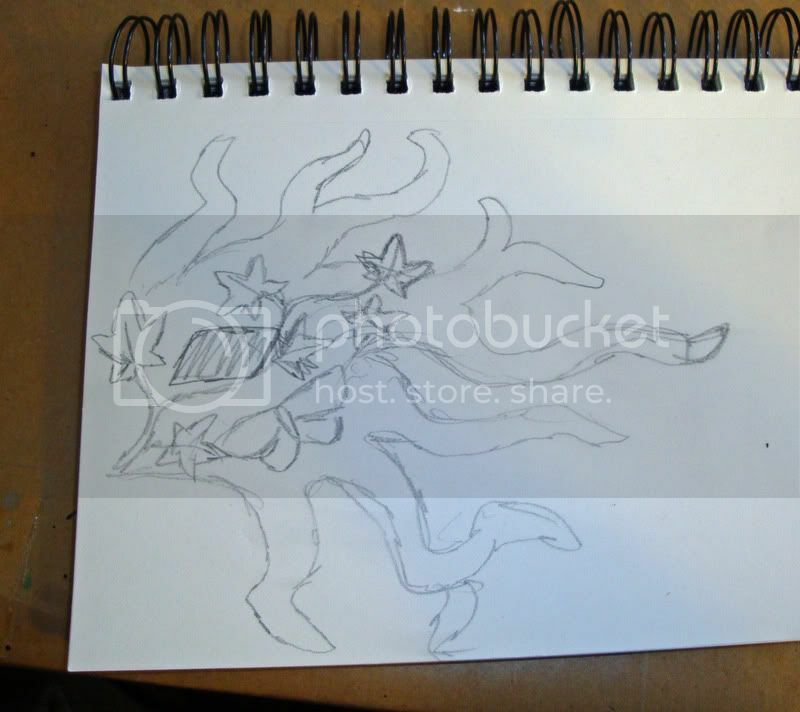 All my mask sketches (unless it's to be an asymmetrical design or a "scene" mask) are of half a design. After all, I only ever need half a design because I can just flip it to get the other half. I have a full "dummy" pattern for eye placement, so all I need to do is line up the eye holes in the half-pattern. I sketched it out pretty quickly & loosely on a piece of brown craft paper (my hides come wrapped in craft paper & I save the stuff for pattern-making). 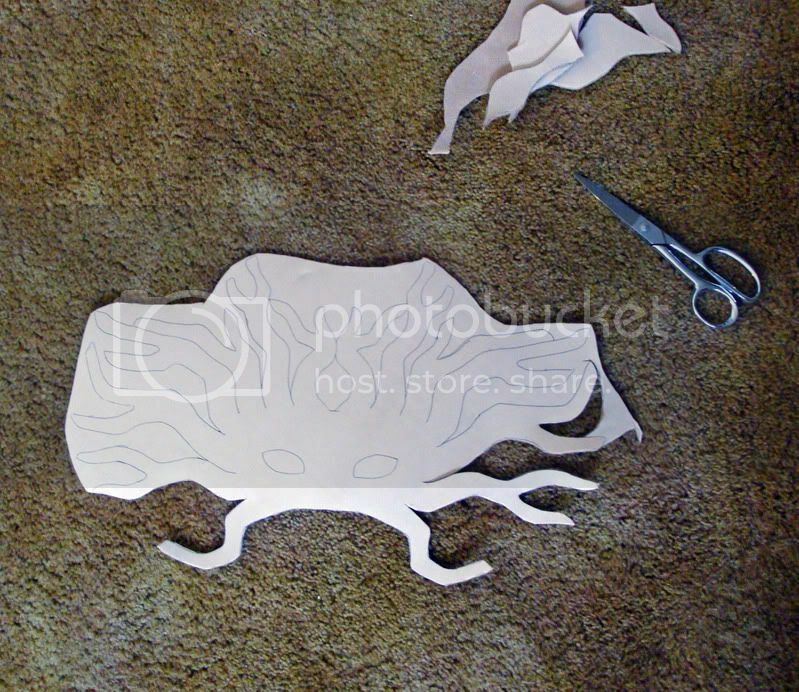 It's all cut out & ready to trace onto the leather. 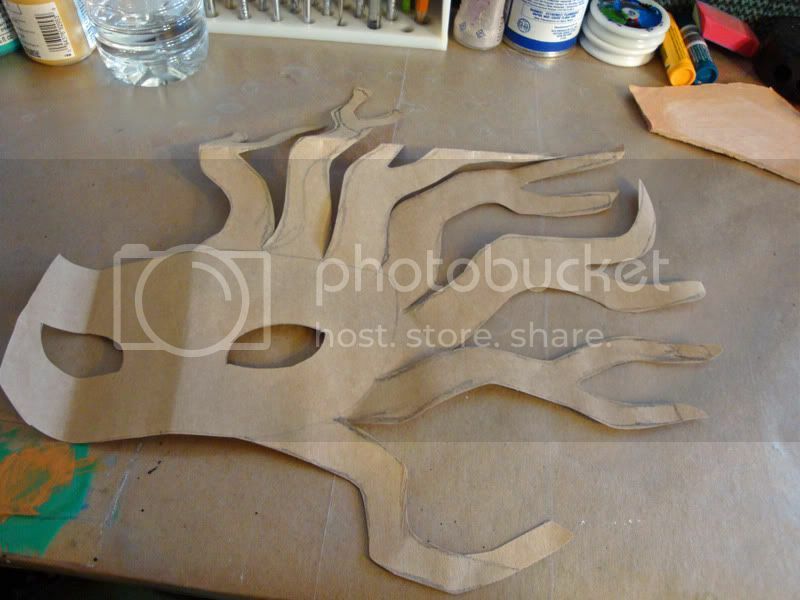 For this project, which has narrowly twisted roots that are long & thin, I want extra-sturdy leather so the roots will be strong, so I use 8oz leather...about 1/4 inch thick. That's pretty thick to cut out by hand. I use heavy duty leather shears. 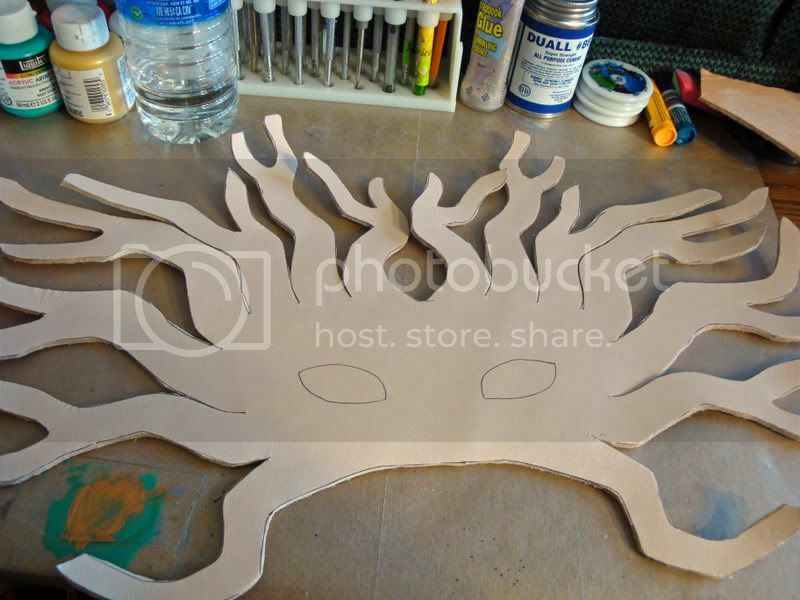 Even so, it takes almost an hour just to cut out this mask & my hands are aching by the time I finish. I use a utility knife to cut the eyeholes. wetting the edges makes this easier to do. I can't tell you how many times the damn skiver skips or slips & I gouge myself instead (I hate skiving!!). I replace that damn tool once a month so it's always as sharp as I can get it (you can't really sharpen these tools). Then, after the edges are cut off, I wet the leather again (warm water works best) and smooth the edges to a nice rounded finish with the "spoon" end of a stylus. When it dries the edge stays nice & hard & smooth. Most leathercrafters don't bother to do this, but I think it makes the mask look "finished" & professional. So now I need to decide what kind of a design I'm going to carve. 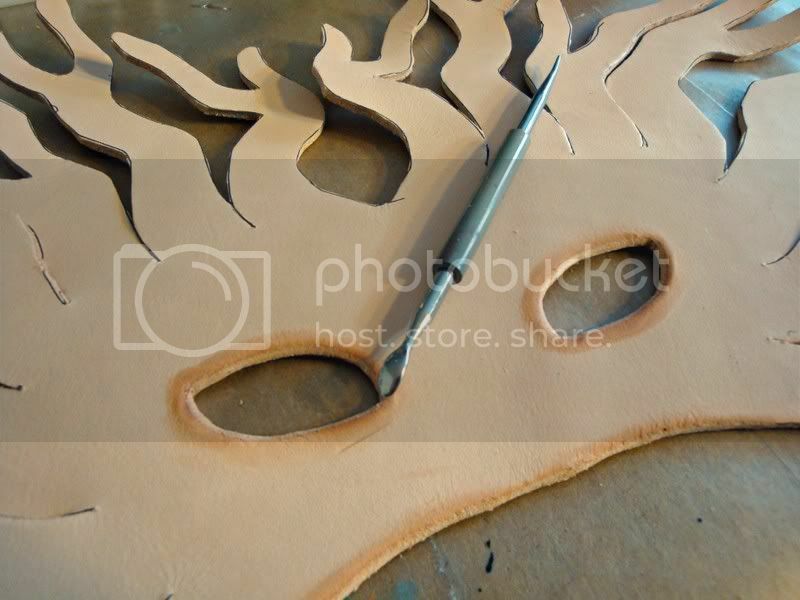 Since this mask is a one-of-a-kind, I don't bother with a pattern or a sketch; I just wet the leather with a damp sponge so it'll take an impression, & lightly scratch my design idea into the leather with the pointy end of the stylus. It's to have ivy climbing on it, and bugs & critters living among the roots. 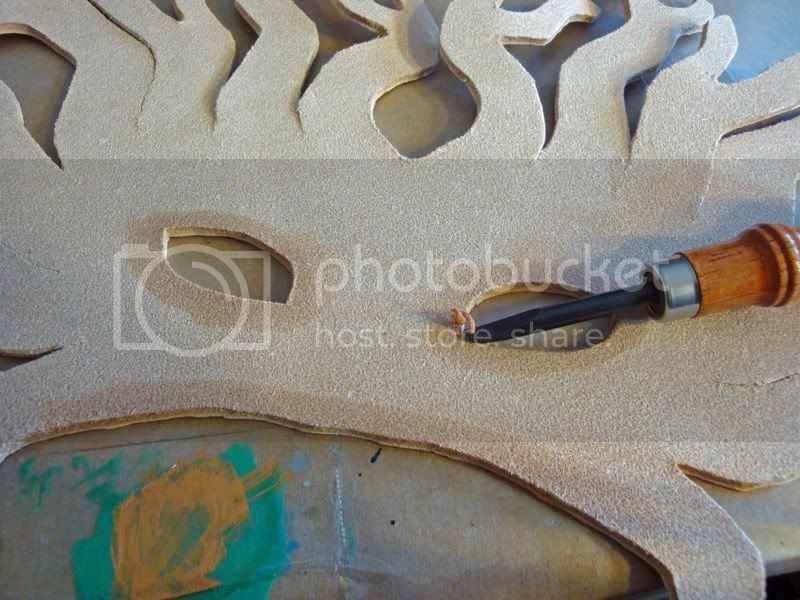 The design is cut into the leather using something called a swivel-blade. Of course I failed to get a pic of it. :-/ I like to use a 1/4 angle ceramic blade. 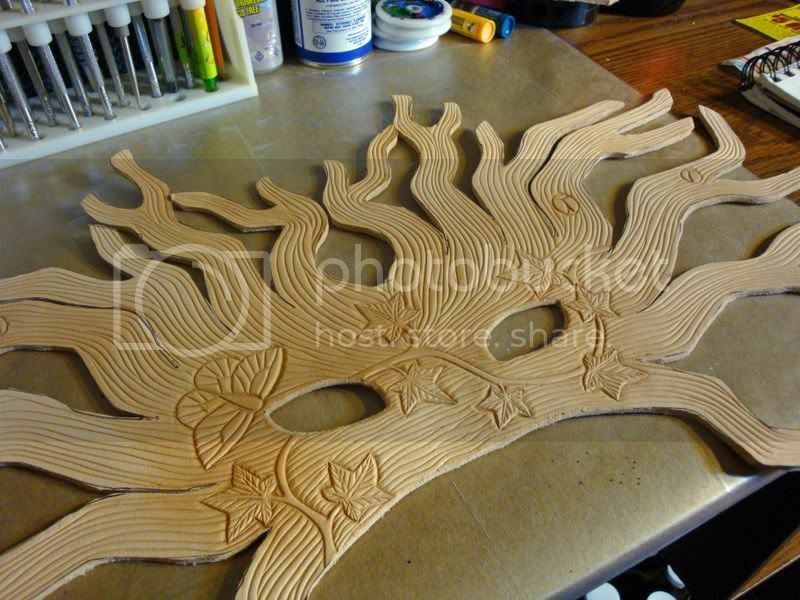 All the carving & tooling has to be finished before I begin shaping it. Tooling is what I did to get the 3-d effect of the ivy & butterfly looking like they are sitting atop the bark. Tooling leather is like carving a wooden bas-relief sculpture, only instead of cutting away the parts you don't want, you press them flat. I use a smooth beveler to do this. Of course, the leather has to be slightly damp (that's called "casing" the leather). The next stage is the SCARIEST part, for me, of mask making. If I screw this part up, all the work I've done until now (hours & hours...3 by now) is all for nothing & the mask will be ruined. This is the part where I shape the mask. Of course, it's also the most exciting part too! I usually put on my i-pod & listen to some loud techno or electronica while I do the sculpting & baking...it motivates me to concentrate & stay on my toes. Mostly I concentrate on the parts that dry out first...long thin parts. I croggle up the roots according to a rough idea in my head for what I want the mask to do...this is the hardest part to explain because sculpting is a 3-d process & not something I can really use words to articulate well. I just see in my head how I want it to be. At this stage, the leather is too floppy to take much more than a kink or a slight curve. I do a rudimentary "nose", mostly just for placement. The whole thing is just mostly flat...propped on the wire rack (not a special rack...just your average normal oven wire rack). After some time (again it depends on how "tight" the leather is...less for tight leather, more for loose leather...a few minutes or so) I pull the hot wet mask out of the oven & do the REAL shaping. I have to work really fast. The water is evaporating quickly. A dry mask is hard as a rock & impossible to shape...even re-wetting it doesn't really work. You have to do it right the first time. This is when I get the face shape just right. I use my own face for the rudimentary nose to eye placement but the rest is just done by hand. I test it against my face to make sure it's comfortable. I use my thumbs & hands to push out the eyebrow ridges from inside. This time it has more strength so it doesn't flop flat on the rack. I use the rack to prop up the mask so it holds it's shape, & it goes back in for another 5 to 10 minutes. 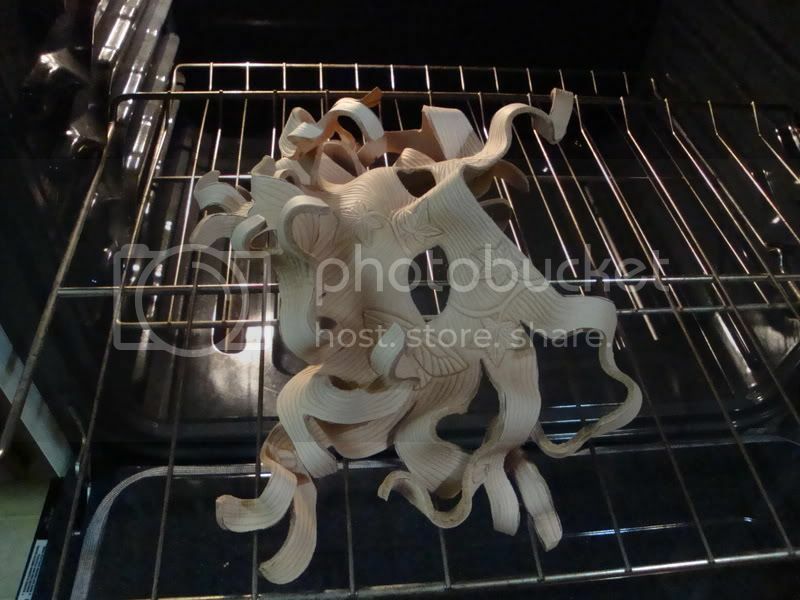 I check it frequently to be sure the oven isn't drying it too fast or singeing it. The whole process should take 20 to 30 minutes and the mask should be just slightly damp still (but HOT) when it is done. 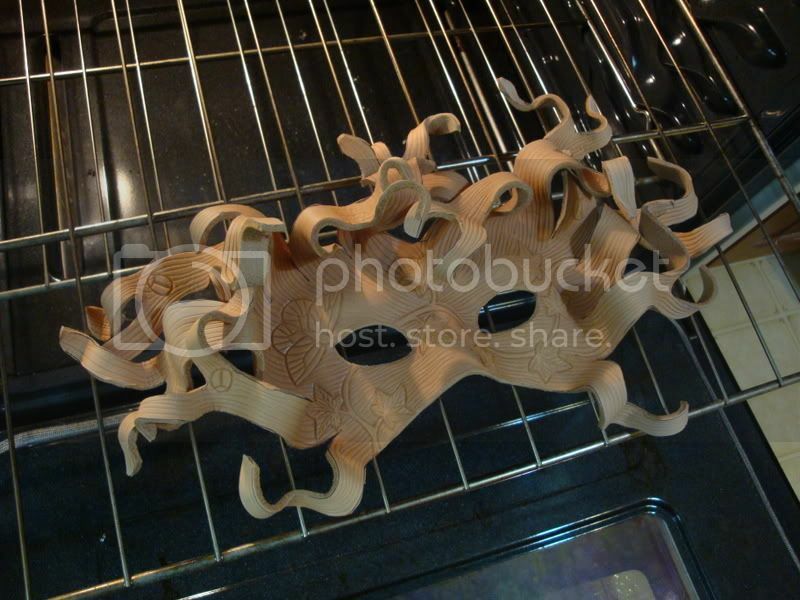 I re-shape & fine-tune it one final time before putting it back into a slack oven to finish drying. This last shaping is to repair any place where the mask "slumped" in the heat, check the fit & the symmetry, & really make the sculpting dramatic & dynamic. I wanted the roots to tangle & come forward over the face the way they do for my Medusa mask, & I really think I got that effect. So the hardest part is done! Next comes coloring. Very interesting and informative. Proves you can learn stuff on the internet, besides just screwing around. When this series is finished, I'm hoping you'll proceed to Volume 2: How Andrea makes the Edible Taffy Mask. LOL...you know, I could totally do that. At what stage do you add the love? Love added throughout! Obviously. ;-) It's my super-secret ingredient. Oh, this is so cool to learn how you do this! I am fascinated. These are my trade secrets too! I'm self-taught so I've come up with my own weird way of doing things. Wow. That was really nice. We have had so few opportunities to see other mask maker's work environment, techniques, etc. It amazes me how different each mummers approach is, and how in the end, for those who are really conscious, professional, and attentive, (not to mention talented) the final pieces are so lovely and different from one another. You have inspired me, and I think I may have to do one of my own. Thank you! ^_^ Yeah, everyone does their art differently. I've noticed that we all have our own style. When I used to do shows, I never minded being in a room with other maskmakers...we all had our own "thing" going. I am adding you to our leatherworks links on our shire website. Thank you so much for this! Cool! Thanks! Make sure to get the second part too (I just listed it). I knew bits and pieces of this from talking to you over the years, but it's really neat to see it laid out like this, with pictures of what the processes look like. 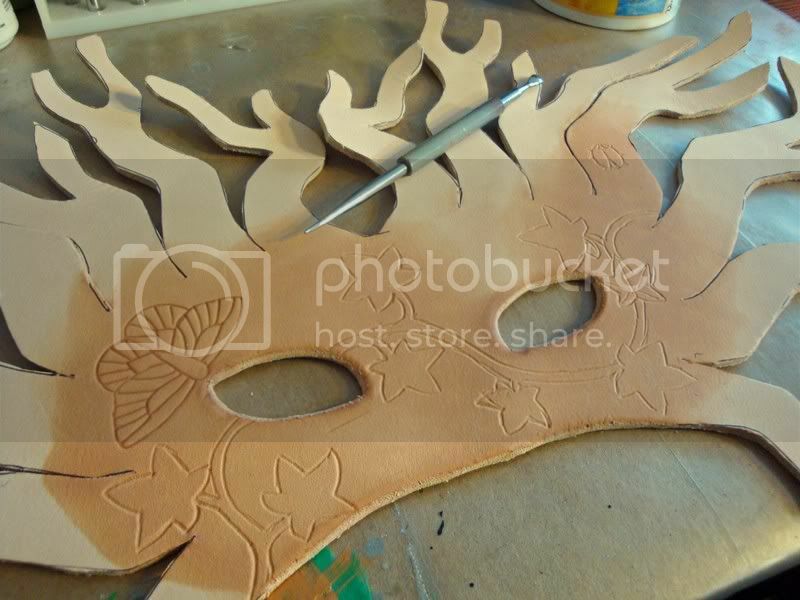 How did you get into leather working--particularly mask making--in the first place? You know...it was an accidental discovery I made one day. Leather can be shaped when it's wet, & if it dries it stays that way. I got into leathercraft for the sake of my sister (who needed an arm guard for archery) & it just took off from there. When I think about it though, this was a medium I'd always been waiting for. As a kid, I was forever experimenting & making things. I LOVED sculpting, but clay was so messy & it broke. Paper mache', close but too impermanent. Wood carving; perfect from a duribility/tactile sense but far too long & difficult to do (also potentially dangerous with sharp knives etc...). Leather was the perfect medium for the ideas I had. that is so cool! thank you for sharing. 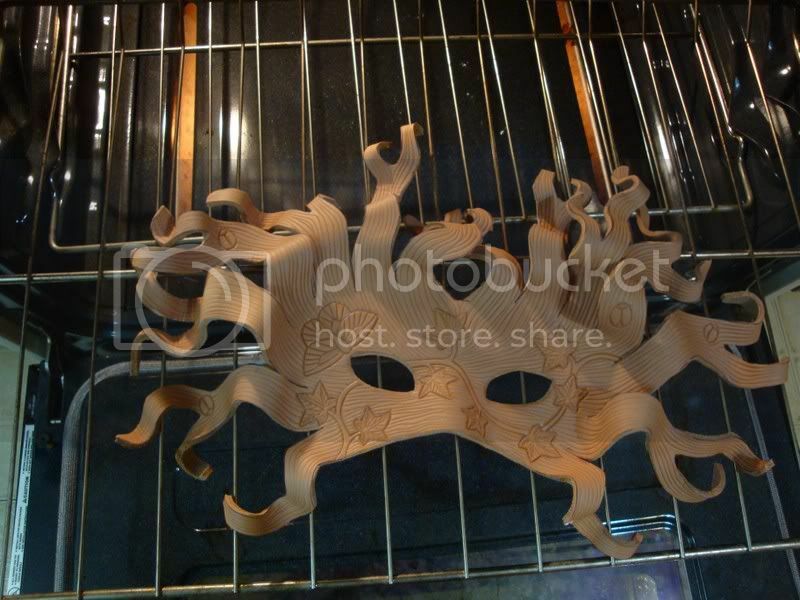 I had no idea about the oven part - I've always been curious about how you shaped the leather. Yep...they're baked! Only the masks though...in the second part of this tutorial I explain how I make more delicate things out of leather, too. Same idea but no heat. Glad you're enjoying it. :-) I figured it was high time I wrote it all down. I have my own funny process & I had to learn it all on my own, so I thought it might help other artists who were curious to try the medium. 2nd-Feb-2009 03:16 am (UTC) - Yay! 2nd-Feb-2009 12:54 pm (UTC) - Re: Yay! Hee! Glad you like it. ^_^ Part two is up now...wait 'til you see how the mask turned out! I found you here through Deviant Art. This is fascinating, thank you. I wouldn't have dared put leather in an oven to dry it - I was too afraid it might crack in the heat. Now I think I might just have to try it, especially if it hardens leather as much as you say it does. 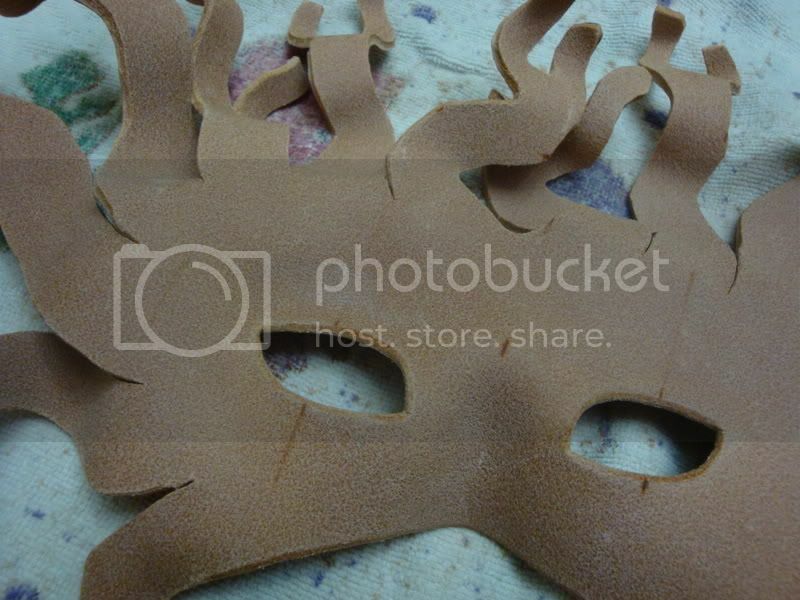 I'm still learning lots about leather mask-work, as I started with papier-mache and will continue to make both. I use moulds to stretch my leather over - which I sculpt myself, and I think they probably wouldn't take too kindly to being heated in an oven, so more experimentation is going to be needed, I think. I'm just getting into the leather carving, and it's brilliant - there's so much scope for design. I don't know why more people don't get into working with this brilliant medium. I know exactly what you mean about skiving though - I hate it too. On to part two, and I hope you don't mind me adding you as a friend. Thank you! I hope this was helpful. I only use the oven for thick leather. Anything thinner than 6oz wrinkles up like a raisin in that kind of heat. You can use heat to "set" a thinner mask on a mold by using a hair dryer. Ethyl alcohol also dries & "sets" thinner leather. Also, dipping leather (even thin leather) in very hot or nearly boiling water will set it...but if there is any carving it'll be damaged (that's why I avoid the boiling water method, even though it's an ancient & historically accurate way of molding leather). Yes, these are your trade secrets for the what... but there's a part of your process which is both why it's so cool to share technique, and not a problem that you do share technique. The whole '...I just see in my head...' thing. That's the part no one else can replicate. Oh, they'll be able to see in their own heads, but that's also why the work will be theirs. Very nice tutorial. I was shopping for masques this past weekend at a local medieval faire. Didn't see anything to match your work, though. BTW, followed your link from Deviant Art. True...I don't mind sharing technique because my "art" remains my own. The designs I come up with & the sculpting I do...that can't be shared or taught. Hello Again, another watcher from DeviantArt enjoying this great tutorial. secondly i was wondering (just shortly because it should be self-explanatory) in what scale the temperatures you give us was: i suppose they are in fahrenheit? 270 degrees celsius would be VERY hot. in Celsius those numbers would be between 100 and 130 Degrees. (just to save people the hassle of converting that themselves. So its a bit warmer then boiling water. i hope this is correct. thank you again for sharing your technique with us! I need to make masks for my BFA project and this was SOOO helpful. HEy! WONDERFULL TUT, omg love it! xD I've been wondering how people do such ornate work without dipping it in boiling water, especially with thinner leather! Thanks so much for this! ONE more question. Where do you get your leather at usually? Ebay? Or a retail leather store? Nope...1-800-TANNERY I get it directly from the Wickett & Craig Tannery in Curwensville PA. They'll ship right to you. "Russet carving" is what they call their veg-tanned leather & it's the best anywhere. Sides are on sale for $90 right now, but if you just want to give it a try, bellies are only $8 or so. I have them cut all my leather down to 8oz. This page was loaded Apr 22nd 2019, 8:45 am GMT.